Greenwich Graphic: Saturday, November 30, 1901, Page 4. Authentic history, as well as popular opinion, as that of the many bullets fired at the daring General Putnam in his mad ride down the hill which bears his name, one passed through his head covering, and this has been verified, for the same bullet has been found. While excavating in the repairing of the drive at the east side of his residence on the Post Road, men in the employee of Mr. Augustus Mead discovered this Revolutionary relic embedded in some three feet of earth. Mr. Mead is strong in his belief that this is the same ball that passed through the General's hat, and luckily so, for it is a three pounder, and if it had pierced the head instead of the hat, history must needs have been re-written, and instead of the thrilling account of a daring plunge down seventy-four stone steps, we would have had simply "Another fearless general killed in a skirmish between the British regulars and the Colonial patriots." This now innocent, unassuming and harmless appearing piece of Revolutionary warfare we believe, with Mr. Mead, is the bullet which might have caused a change history and deprived the schoolboy of what is near and dear to his heart – stories of adventure and daring, and if a thorough scientific and scholarly investigation should be had, with employment of algebra, geometry, or the higher mathematics, taking the hypothesis: the position of the rider, the angle at which the bullets were fired, and the distance traveled, together with other data, the only logical and current deduction would be as we have stated. We are told that a picture of Putnam can be traced on the cannonball, with a date when it struck him. We have this on the authority of Mr. John Dayton, whose word is to be relied on. But to be serious with regard to this cannon ball. Opposite this place on the farm of Jabez Mead, often in ploughing, English coins were turned up, and the supposition is, that is more or less skirmishing was carried on in this locality during the Revolution, this evidence of British soldiers is accounted for, as in the case of this old relic of long ago. 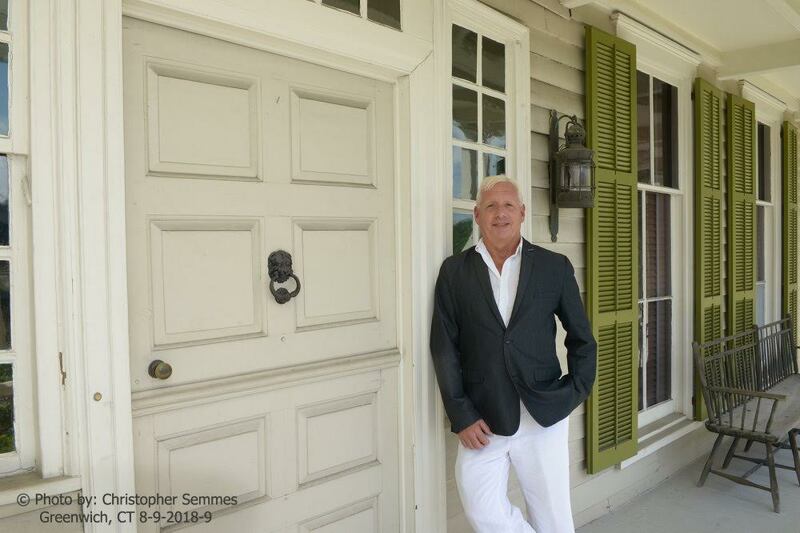 Historian and town native Jeffrey Bingham Mead, a descendant of the founders of the town, is the host of an upcoming new show on NewsTalk AM 1490 WGCH and WGCH.com anywhere. Greenwich, Town For All Seasons is scheduled to air every other Wednesday morning 9:00 a.m.-9:30 a.m. The show’s creator and host, Jeffrey Bingham Mead, is no stranger to Greenwich history. Born and raised in Greenwich, he as a direct descendant of one of its founding families. His background and interests are varied and ever-evolving. Mead is a former board member and trustee of the Greenwich Historical Society; former local history contributing writer at Greenwich Time in the 1980s and 1990s; the vice-president of the Capt. Matthew Mead Branch of the Connecticut Society of the Sons of the American Revolution; a university professor and lecturer in the states of Hawaii and Connecticut; president and co-founder of History Education Hawaii, Inc., the Hawaii Council of the National Council for History Education (since 2006); president/founder of the Historic Mead Family Burying Grounds Association, author of Chains Unbound: Slave Emancipations in Greenwich, Connecticut, and more. Mead is also the creator, producer and host of the highly successful Marvels of China: Pathways to the Pacific Rim show on WGCH. Now in its third year, the show has an international audience and its heard in China with plans for national syndication across the USA in the near-future. The show has a Facebook site that all are invited to join by clicking this link. The first show featured CEO and Executive Director Debra Mecky from the Greenwich Historical Society as it prepared to celebrate the public reopening of its reimagined campus on October 7, 2018. “We’re looking forward to establishing long-term strategic partnerships with the town’s historic preservation organizations. Greenwich is a town for all seasons and all people -everyone is invited to our celebration of the town’s culture and heritage,” Mead added. Click this link to visit and listen to archived broadcasts of Greenwich, A Town For All Seasons. Visit this link for the official blog site. Contact GreenwichATownForAllSeasons@gmail.com to be added to the email list for announcements and updates. Sponsors and Potential guests can contact Jeffrey Bingham Mead at JeffreyBinghamMead@gmail.com, GreenwichATownForAllSeasons@gmail.com and via LinkedIn and Facebook. Greenwich Graphic: Saturday, January 26, 1907. Page 1. 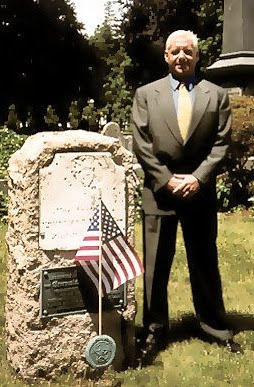 Was found by J. R. Mead of Kansas City, a Great Grandson – the Tombstone was Lying on its Face Down, and Was Broken – Who This Colonial Patriot Was. Copyrighted 1901, by Erwin Edwards. Over in the meadow, just at the foot of Put's Hill, in a little hillock, the waters of Ten Acres almost reaching it, is the grave of Major-General Ebenezer Mead– a soldier of the Revolution. 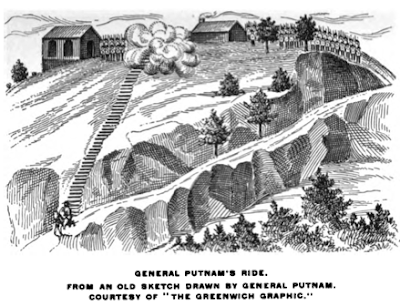 Just above it, on the top of the hill is a handsome boulder in memory of General Putnam, which tells to the hurrying passer-by in his automobile, or in the trolley car, that was the spot where Putnam started on his perilous ride over the precipice, and made his "plunge into history." Forgotten, neglected and unmarked, is the little grave in the meadow, near where the busy world of flies by, just below the handsome boulder. But General Mead played his part in the war for liberty, as well as "Old Put," and now that his grave has been found, it will be marked with a fitting monument. There came to Greenwich, last summer a man from Wichita, Kansas, J. A. Mead, and with him his wife and two children. It was the home of his boyhood, and he returned to his native town to find the grave of Maj-General Ebenezer Mead, and also to see the old place in which he was born, in which he left a half century ago, to seek his fortune in the west, and he wanted as well to look up his kinsman. He was here but a day or two, he found old Greenwich so different from what he expected, in many ways, he tarried but a short time. But his real purpose he accomplished, the finding of the grave of his patriotic ancestor, and he went away as quietly and on ostentatiously as he came. He had become a very successful businessman in the west, had made money and was rich, but now as he was beginning to go down the sense that side of life, although a vigorous and healthy man still, his mind reverted to the scenes of his boyhood, and he often thought he would like to visit the old town, find a grave of General Ebenezer Mead, and put a granite monument over it. It was with such intention that he came to Greenwich, and after trying to get in touch with his relatives, went to the house now occupied by John Maher, and accompanied by Mr. Maher and accompanied by Mrs. Maher finally located what he believed to be the grave. "We visited the grave and noticed a marble slab sunk level with the surface at the north end, and it occurred to me that there might be an inscription on the stone underground. I will be pleased if you will visit the spot and dig down and examine the stone very carefully, wash it if necessary and write me exactly what is on it then replace as before." "Major-General Ebenezer Mead, died February 7, 1818, aged 70 years." "The information, yours of the 26th, contained, is very gratifying. It confirms the statement I made while in Greenwich as to that being the grave of Gen. Mead, my great-grandfather. My grandfather, Col. Ebenezer Mead, my father Rev. E. Mead, and my uncles Ebenezer and Theodore all pointed out the spot to me, with at that time a picket fence around it, as the grave of General Mead. It was was customary in colonial days in later to bury the proprietor of an estate upon the premises. Now that the identity of Gen. Mead is established beyond question it is a matter of historical interest that the spot should be suitably made prominent by monument or otherwise." Mr. Mead in a later letter said: "Gen. Mead was shot through the lungs by a musket ball early in the war for Independence, and in dressing the wound the surgeon drew a silk handkerchief through his body. I was told this in 1846 by old men who were there at the time, also by my grandfather and grandmother, otherwise he might have taken an active part in the war as the rest of them." It was not fully understood that there were two Meads in the Revolutionary war. 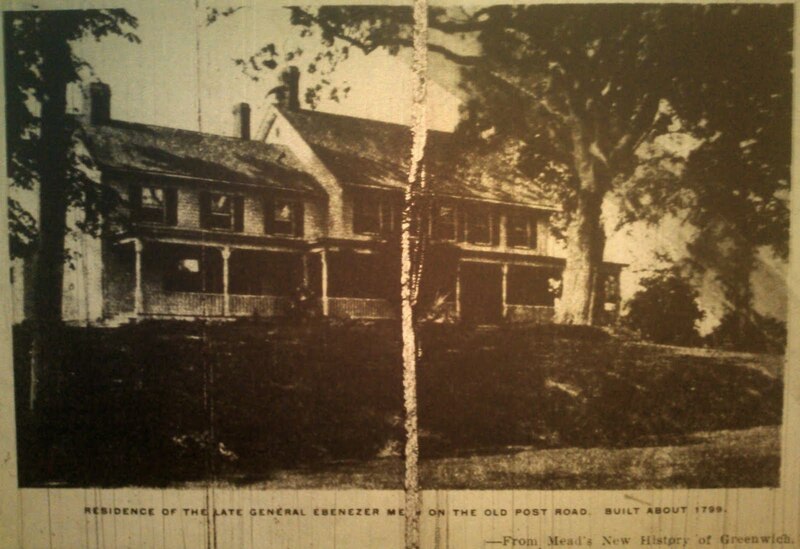 Ebenezer Mead, the Gen. Mead here referred to, served as a private in Capt. Joseph Hobby's Company, Lt. Col. John Mead's 9th Regiment, from Nov. 11th, 1776, to Jan. 11th, 1777. The regiment was ordered to Westchester County and employed in guarding its borders. As the latter take fixes the time when he seems to have dropped out of the service, the wound, referred to above by J. R. Mead, may have been suffered about this time, and the resulting sickness was doubtless the cause. He stood in the doorway of the house where John Maher now resides and saw Gen. Putnam ride down the hill when surprised by six dragoons. He saw General Putnam come tearing down the hill, saw him turn in his saddle as he reached the bottom and gained the turnpike, and heard him holler "damn ye" to the tories, who were firing at him from the hilltop. After the war Ebenezer Mead came again into notice and gained distinction as a training master in the militia. He was Major in the Connecticut Militia in the War of 1812, under Colonel Samuel Dean, and at the same time of the scare, caused by the appearance of a British fleet under Commodore Hardy, off the eastern end of Long Island Sound, which had almost complete control to Throgg's Neck, he was detailed to guard the coast against invasion. He stationed his forces at several strategic points, prevented the enemy from landing, and finally compelled withdrawal of its forces from the waters of the Sound. He ultimately rose to the rank of Major General. John Mead at the commencement of the Revolutionary war entered the American army as a Major. King George had previously sent him a Captain's commission, which he declined. Within a month he was promoted to be Lieutenant Colonel, and three years before the end of the war was commissioned a Brigadier General, and had command of the American lines at Horseneck. Ebenezer Mead, his cousin, was a private an Captain Hobby's company, John Mead's regiment, and it lessens in no degree the credit due to Ebenezer Mead to explain and correct the impression that he then served as officer instead of private. The meagre record shows that his service temporarily ended in November, 1777, probably from the serious wound described above by J. R. Mead as told him by his grandfather. For he figures later as a training master of militia, taking part in the war of 1812 was a Major to which he advanced meantime. And his promotion thus started continued as the result of meritorious service in connection with the Connecticut militia until reaching the major generalship, under which he served with distinction through the later years of his military career. John Mead's military record before the Revolution was as a lieutenant of the West Company of Greenwich in October, 1757, promoted to captain in October, 1767, and in May, 1773, receiving commission as Major in the 9th Regiment, Connecticut Militia, advancing therefrom to Lieutenant Colonel as the record shows, within a month after the beginning of his service in the Revolution. He saw much active service on the Brooklyn front before and during the Battle of Long Island in August, 1776, and in the retreat from New York was in command of the last attachment that left the city. He was in the Battle of White Plains in October, 1776, and was afterward posted at Horseneck, where he remained during the greater part of the war, joining in many other engagements. A character he was firm, decided, perhaps severe, but like all Meads exceedingly just. He spent the whole of his life in Horseneck, where he had a large farm, and his house was almost the first in the village of Greenwich at the west. He was a member of the Connecticut Legislature for eight years before, eight years during an eight years after the Revolution until 1797, twenty consecutive years; was also justice of the peace for Fairfield County from 1769 until 1774. He died in December, 1790, in his sixty-fifth year, and was buried in the old graveyard Put's Hill, the exact spot having become unknown long before the removal of bodies there from to Putnam cemetery. Greenwich Graphic: December 21, 1907. Mr. Alexander Mead, due to physical ailment that began to give him some annoyance, took occasion to go away from Greenwich in search of relief. He has gone forth and back the past several years, staying away as much as his affairs would permit. On his return in late fall he found that his general health had been improved, and it has thus far continued so evenly that he is encouraged that he may not soon again be compelled to take a prolonged trip from home. This is the 40th anniversary of the opening by Mr. Mead of his first greenhouse: and it was not opened with expectation of engaging in the business, rather as a diversion from the prose of farming. But at once there came such demand that almost without realizing it this enterprise became established, other greenhouses were called for, and ere long the biggest concern of its kind hereabouts was a verity, and has been maintained with notable increase as the years have flitted by. Forty years ago the only other greenhouses near here were in Stamford. There was no competition to stimulate effort, but flower culture was his pleasure, the results were choice, and the inclination of the people toward the beautiful being invited, the demand grew and kept growing. And down to this Christmas tide it has continued with the resultant large establishment, with its prosperous surroundings and its thousands of lovely flowers, its plants and its foliage and the urgent call. Well it deserves to be known, as it is, as one of the places to see ere a Greenwich visit is enjoyed. The display now is particularly inviting. Poinsettias, so suitable to the time, are there in perfection. And also are azaleas, cyclamens, primroses, carnations, violets; and palms, ferns and holly, with wreaths and roping as well as cut flowers to meet every time and requirement. Mr. Mead welcomes all calls and his green houses will continue to attractive evolution his application of intelligent and up-to-date methods has made possible, in which his personality so pleasingly supplemented. A few days ago on September 19, marked the anniversary of the passing of Daniel Merritt Mead, a native son of this town and one whose memory and legacy should be remembered from time to time by the town’s citizenry. Daniel dutifully served his county in a time of chaos and confusion. He was in the Yale Class of 1854, and he passed the bar and practiced law in New York and Connecticut in 1855 and 1856. He was a founding charter member and the first Junior Warden of the masonic lodge Acacia 85 and first formal historian of the town. “Captain Daniel Merritt Mead, a twenty-eight year old lawyer who had already written a comprehensive history of Greenwich, commanded I Company. Mead was born in Cos Cob on June 2, 1834. After attending Yale and Law School, he was admitted to the Connecticut Bar and began practicing law in Horseneck. He married Louisa S. Mead, completed his history of Greenwich in 1857, and enlisted as Captain of I Company, the Tenth Regiment, Connecticut Volunteers, on September 6, 1861. 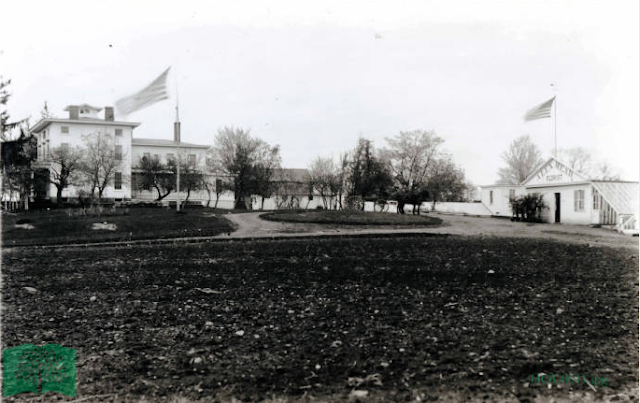 The Tenth was mustered into service at Camp Buckingham near Hartford, Connecticut. From there, the regiment, Mead‘s I Company included, entrained for Annapolis, Maryland, where it was assigned to the First Brigade of ‘Burnside’s Division.’ With two months of training and drill to form and firm it, the regiment shipped out on transport for its first engagements in North Carolina. From that point on, the Tenth fought in practically all the nameless battles, fights and skirmishes that took place in eastern North Carolina and along the James River in Virginia for the remainder of the war. The battle record reads like a provincial Piedmont train schedule: Slocum’s Creek, Plymouth, Trenton, Tarboro, Rawle’s Mills, Hamilton, Williamstown, Goldsboro…. Then came Kinston, in December, 1862. Seven thousand rebels held this North Carolina hamlet. Several Union regiments had attempted to carry the enemy position – without success. Now the Tenth was called in from the rear. It passed one beaten brigade, then three regiments of another. The order was given to charge. Rolling onward, the Tenth literally had to leap over the men of three more Union regiments lying down in the line of battle. Ahead stood a rebel brigade holding the bridge over the Neuse River and the road into the town. The Tenth routed these defenders almost peremptorily. The bridge was aflame now, set ablaze by the retreating Confederates. The Tenth raced across as the timbers crackled and the bridge began to yield beneath their weight. Sweeping by four field pieces that had been pounding at them as they advanced, the Tenth stormed the town itself. When it was over, the regiment had captured five hundred prisoners, eleven artillery pieces, hundreds of small arms, and uncounted valuable documents. They had suffered one hundred and six killed and wounded in action. Then came Whitehall, Goldsboro again, Sealbrook Island, James Island, then Fort Wagner. They were withdrawn for a brief rest in St. Augustine, Florida – sixty percent of the regiment incapacitated by sickness and disease. Brief was the word for it. Soon they were back on their maddening milk run of battles. By April, 1864, the tracks cut through the once-placid country and around the James River in Virginia…Walthall Junction, Drewry’s Bluff, Deep Bottom – just nine miles from Richmond, Strawberry Plains, Springfield, Deep Gully, Fuzzell’s Mills, Petersburg, Chapin’s Farm, Fort Harrison, New Market Heights. At one point, the entire Army Corps, of which the Tenth was a component, was suddenly exposed to a surprise attack on the North Bank of the James River. Only the Tenth Regiment saw the rebels coming. Unaided, they mobilized and turned back a Confederate force that outnumbered them ten to one. By September of 1864, the regiment’s three-year term of enlistment was up. From this point onward, substitute recruiting filled its ranks. Only ninety of the Tenth’s original members remained until the close of the war. One Brigade Commander had said of them, ‘…for steady and soldierly behavior under most trying circumstances….they may have been equaled – but never surpassed.’ The tribute had been paid for dearly. Some few lucky ones had returned home to Greenwich in that weary September. They majority had been cut down by cannon shards, musket balls, exhaustion and disease. And so, I ask the citizens of Greenwich, from time to time, to remember Daniel Merritt Mead’s honor. To remember his sacrifice, to remember his name.